Traveloko Top rated freight company specializing in freight shipping services. Get a free freight quote now! Or become part of our company. We are a team of highly motivated personnel dedicated to provide you best service and freight shipping rates available in industry. Our strength is generated from our commitment to you as client, our industry, and our partners.Traveloko’s personal attention, professionalism, extensive carrier network, and experience sets us apart from other companies. Traveloko has been of great service to our company. With the many variables that surround this industry, it is very important to find a reliable carrier to make the day-to-day operations possible. Communication, transparency and overall service are where Traveloko excels. I would recommend their service to anybody! I work a lot with Sam from Traveloko... He is always sure to let me know were his trucks will be and always keeps his rates the same... They never go up on rates due to rates being high in a certain location... Very fair.. They have great drivers and I never have to worry when Traveloko is on one of my loads. Our customer just wanted us to pass along how they are impressed with Danny. They said they do not run across many drivers like him, and wanted to pass along how pleasant and a hard worker Danny seems to be, I am sure you value Danny as he seems to be quite an asset to Traveloco. Feeding America and Choptank would like to personally thank Danny for his extra efforts and tenacity during delivery in to Colorado Springs Food Bank. Have a good day, and thanks again. Traveloko has proven time and time again to be a very dependable trucking company. Their dispatchers are always trustworthy, professional and understand communication. Their drivers are experienced and know this industry. They have a sense of urgency on each and every shipment and their service standards are very high. The office led by Dan Najmi has especially been very helpful. I have an excellent relationship with Dan, Ralph, Alex, Daniel, Bill, Nathan and Charles. I look forward to continue working with Traveloko for many years to come. I wanted to let you know that your driver Darius has been exceptional. He has followed all directions Stevens Transport TL has asked of him. He does his check calls and location checks daily. He is friendly and professional. He was not just one time for his appointments but early. I truly hope he calls me for loads in the future. I wish all drivers were as respectful and pleasant as Darius. It has been a pleasure working with Darius and Traveloko. We will protect not just your product, but your brand. Late or non-compliant shipments can damage your customer relationships. We will do everything not to let that happen. Safeguarding your shipments against rejections, delays, charge backs, damages and over-handling is our priority. Our freight capabilities include the standard shipping and commercial trucking you would expect as well as specialty hauling services that cover a wide variety of special loads. No matter if your need is a one-time delivery, or you seek long-term logistics partner, our trucking capabilities and customer service make us the right freight choice for your company. We know when you’re in the need of an expedited shipment that every second counts! That’s why our Expedite Service is the simple solution for your time-sensitive shipments. When normal speed isn’t fast enough…than you use Traveloko Speed. You need to know where your goods and equipment are all the time – total supply chain visibility. Reduce transportation costs by automating day-to-day shipment execution. It’s time to optimize your supply chain with Traveloko technology. 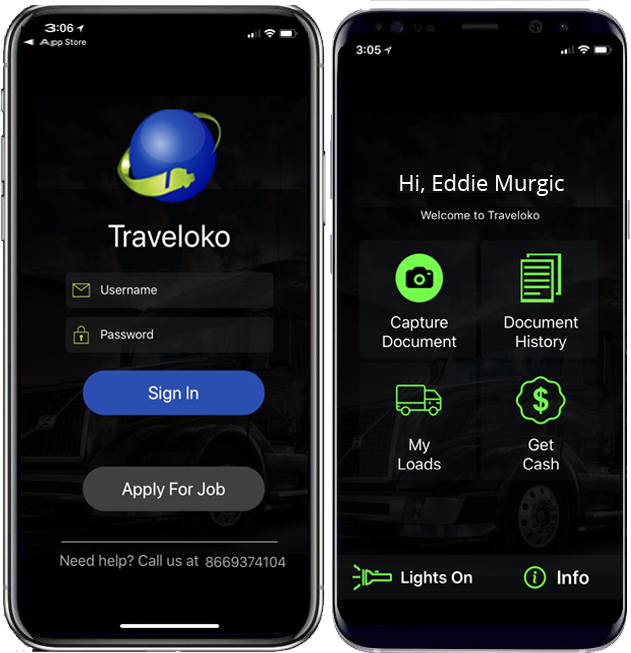 Traveloko® SmartPhone APP is free and easy to use application designed for our contracted owner operators and drivers. This application is designed for better performance to our customers and as well as owner operators and drivers. We have integrated features that no other company has it or ever combined it in package as we are.